Like most women, I’ve tried a few anti-aging oils and creams. I was not impressed. Then I discovered how much better for your skin organic products are, and tried a pretty good facial oil. Only problem, it was $105 for a 1 oz bottle. Not on my budget for sure! Then I learned how to make my own. I’m so pleased to tell you that it is quite a bit better than the $105 one, and mine is only $38. I’m all about making organics affordable. 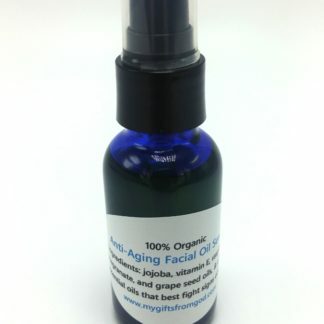 Before I used this facial oil, I had problem skin. Uneven skin tone, rosacea, large pores, and blemishes…even in my 50s. Now, my facial skin is unbelievable! My skin tone is perfect. The rosacea is gone, my pores are minimized, and I haven’t had a blemish yet, not one in three years! I can’t recommended this product enough. Every ingredient in this formula was hand picked for maximum age defying benefits. Jojoba is a very unique ingredient. I use to think it was an oil. It’s not. It’s a liquid wax found it the huge seed pod of the jojoba plant. Jojoba is the only substance that is bio-identical to human sebum – an oily substance naturally produced by the oil glands below the skin surface. It seals in moisture and creates an effective barrier to external elements. 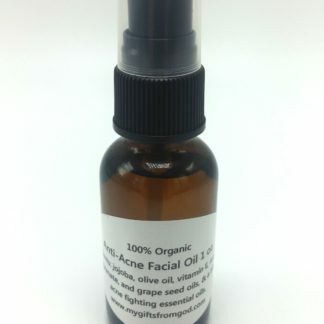 Grape seed oil is a great source of polyphenols – flavonoids, essential fatty acid – linoleic acid, vitamin E, and oligomeric proanthocyanidin, making it the perfect addition to this facial oil for it’s ability to treat dermatitis, acne, wrinkles, dry and itchy skin, and age spots. 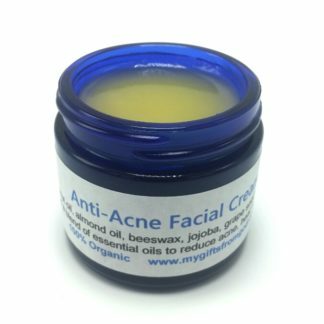 Grape seed oil has been very effective at eliminating dark circles under the eyes. It is also an anti-inflammatory, anti-oxidant, anti-histamine, anti-aging, anti-allergic, antimicrobial, and adaptogenic. 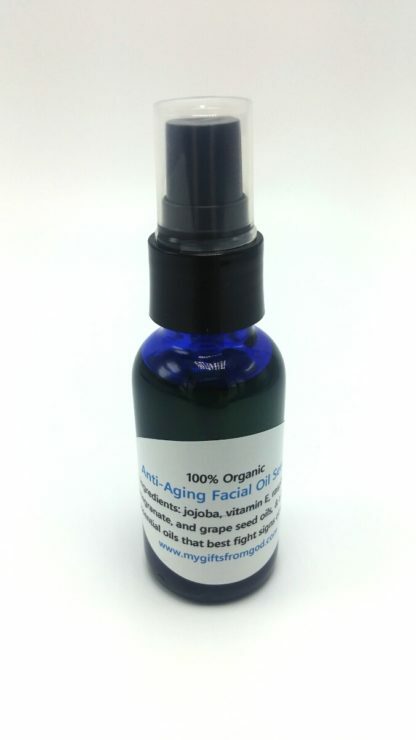 Carrot seed oil is wonderful at giving our skin better elasticity, making it a great anti wrinkle ingredient. 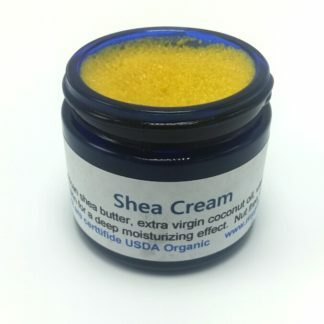 And the perfect blend of essential oils to not just make your skin look younger, but to heal age spots (hyper-pigmentation), reduce the appearance of wrinkles, and protect your skin from the affects of sun damage and the natural aging process. 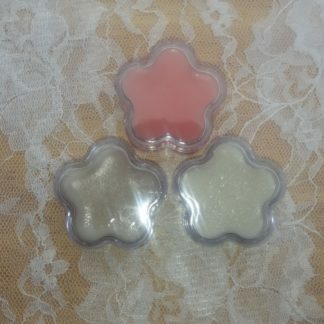 Ingredients: organic jojoba, organic pomegranate seed oil, organic raspberry seed oil, organic grape seed oil, organic vitamin E oil, organic carrot seed oil, organic lavender essential oil, organic rose geranium essential oil, organic sandalwood essential oil, organic cypress essential oil, organic lemon essential oil, organic frankincense essential oil, organic myrrh essential oil, organic patchouli essential oil. Comes in a beautiful 1 oz cobalt blue glass bottle to protect the fragile essential oils inside. Excellent for men and women age 30 and up. Apply to clean skin, after washing, once or twice a day. Use lightly, as a little goes a long way. Works perfectly with our Amazing Grace Facial Bar! I bought this as a gift for my mother. She’s been using it for a few months now and I’m amazed at how much healthier and younger her skin is. Small lines are disappearing and her complexion is so smooth that she doesn’t even use a covering fountain anymore. This product is very impressive! I can’t believe how great this is. I’ve never received so many complements on my complexion before!! Just wow! A friend recommended this to me because I’m getting those lines around the eyes. I was not use to putting stuff on my face. Just a wash and go kind of guy. But I have to admit I’m a huge fan. I’ve been using it for 2 weeks and I can already see a difference. My wife and I have been using this for 2 weeks and we both see a notable difference. I swear my face looks healthier and less wrinkled. My wife loves it too. I caught her looking extra long at herself in the mirror this morning. I love seeing her so happy. Really good product. I highly recommend this and the amazing grace facial soap. An absolute must have in my beauty regimen. I have been using this for 2 years now and I swear my face looks younger than it did 7 or 8 years ago.